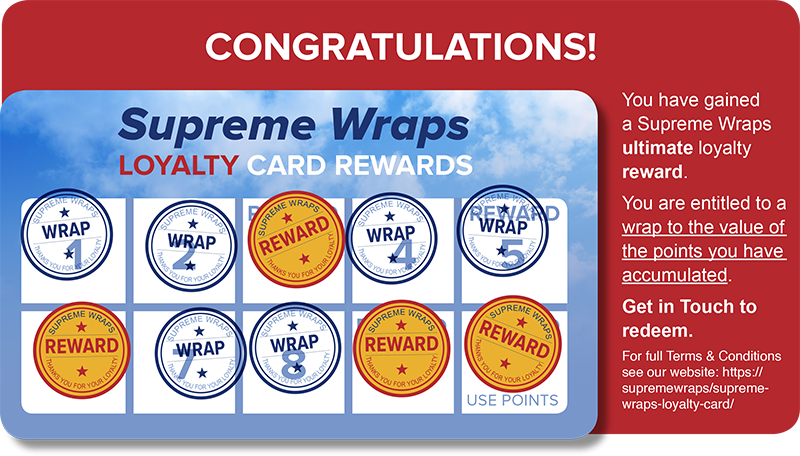 Your Supreme Wrap Loyalty Card will commence once payment has been received for your first Wrap. Points received will be calculated at 5% of total amount paid. Points expire after two years from date applied. Following payment of 3rd wrap, we will shout morning tea. Following payment of your 6th and 9th wrap’s, we will shout an onsite BBQ lunch. Following payment of your 9th wrap, we will total up your points earnt and these will be used towards your 10th wrap, points earnt may cover the entire 10th wrap. All points must be redeemed on the 10th wrap. Clients may sub-contract to others to gain points on their loyalty card PROVIDED it is paid for by the assigned Loyalty Card holder.